Bharatanatyam is a traditional dance form which is being learnt by many women all over the world. 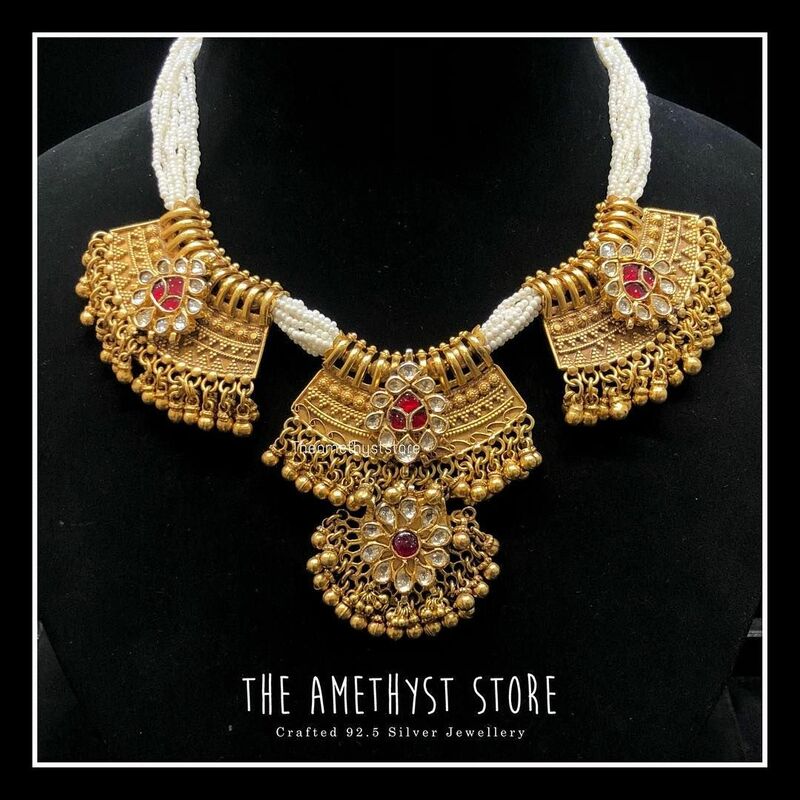 Bhaaratanatyam jewellery is special as they have to be designed in a traditional manner incorporating the legacy these jewellery carry. These jewelleries are not only worn by dancers. These classic pieces have found a way to get into the heart of every traditional jewellery lover. Yes, this year the kemp jewelleries are trending hot amidst jewellery lovers. 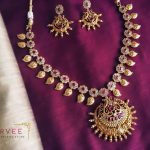 If you are one of the admirers of the bharatanatyam temple jewellery then these are the top 10 brands to buy semi precious temple jewellery from the comfort of you home. 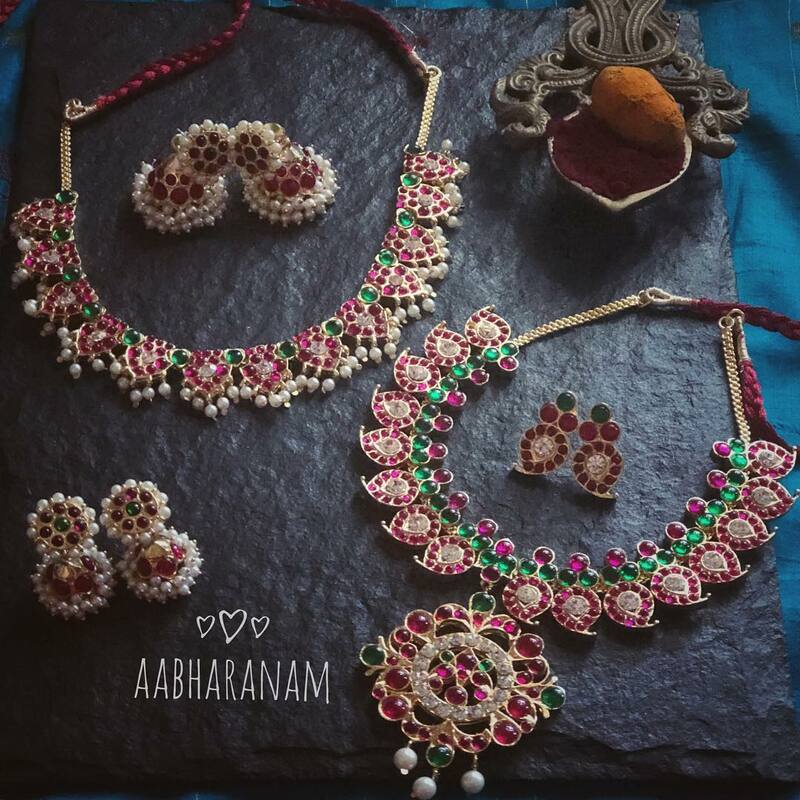 Abharanam is one brand which designs bharatanatyam temple jewellery mixing traditional designs with latest trends. 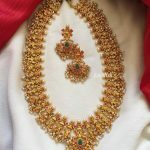 The necklaces, hair accessories, head sets, long harams are uniquely designed. The speciality of this brand are the thread necklaces with pendants studded with semi precious stones. 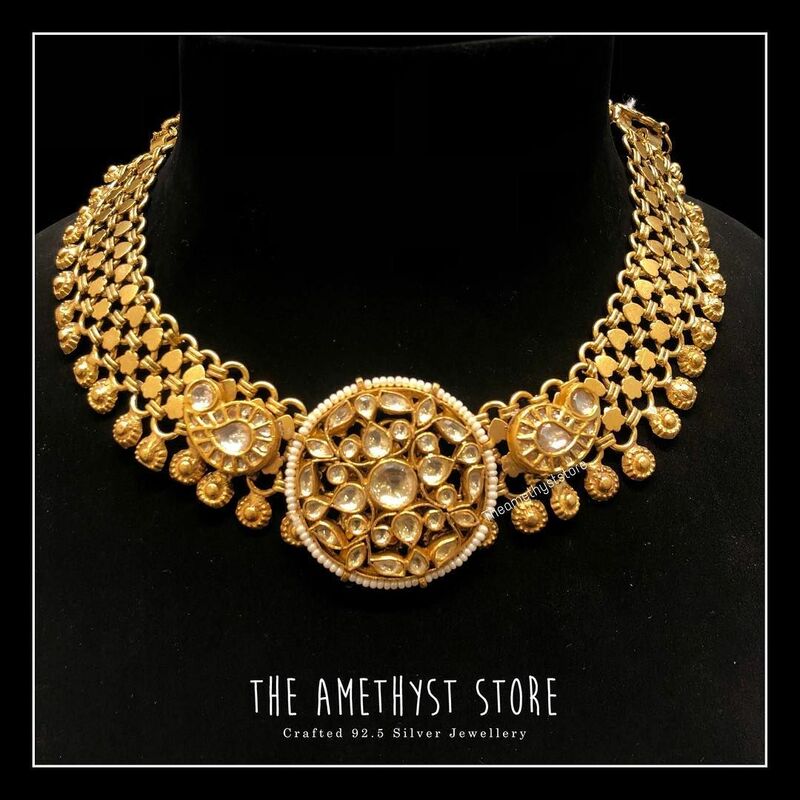 The neckpieces in various lengths with traditional pendants and matching earrings from Abharanam collection can mesmerise anyone. 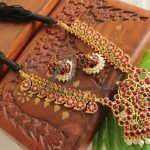 The exclusive temple jewellery necklaces and other hair accessories such as nagaram can make any woman fall in love with this jewellery. Darpana is another brand that has a wide range of exclusive hand made bharatanatyam temple jewellery. 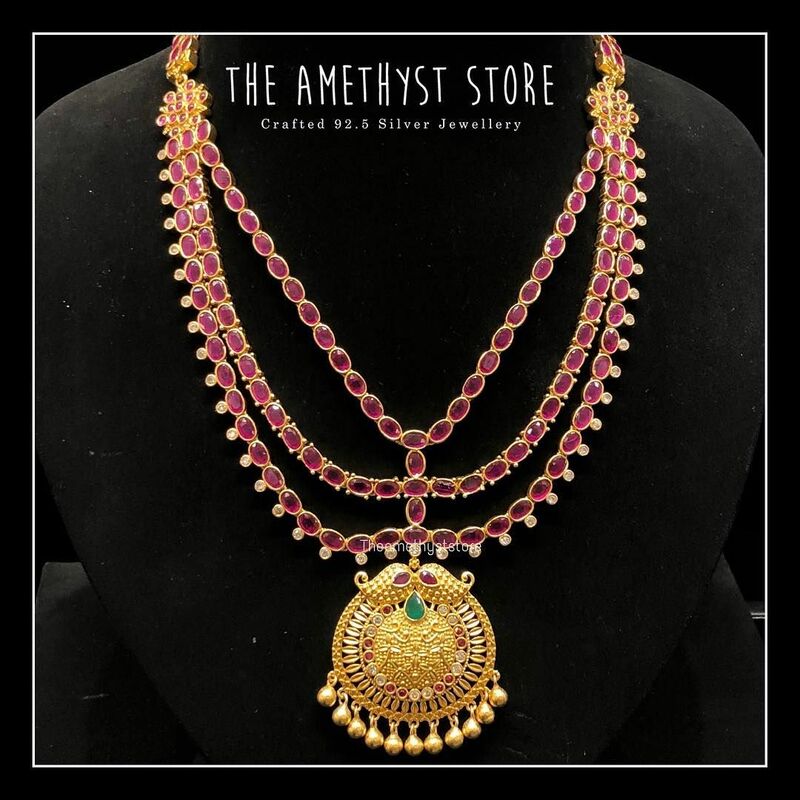 The specialty of this brand is that they make exclusive traditional jewellery pieces and contemporary jewellery such as beads necklaces with an ethnic touch of traditional pendants. Black thread necklace are the in vogue and the black thread necklaces with contemporary pendants are sure to melt your heart! 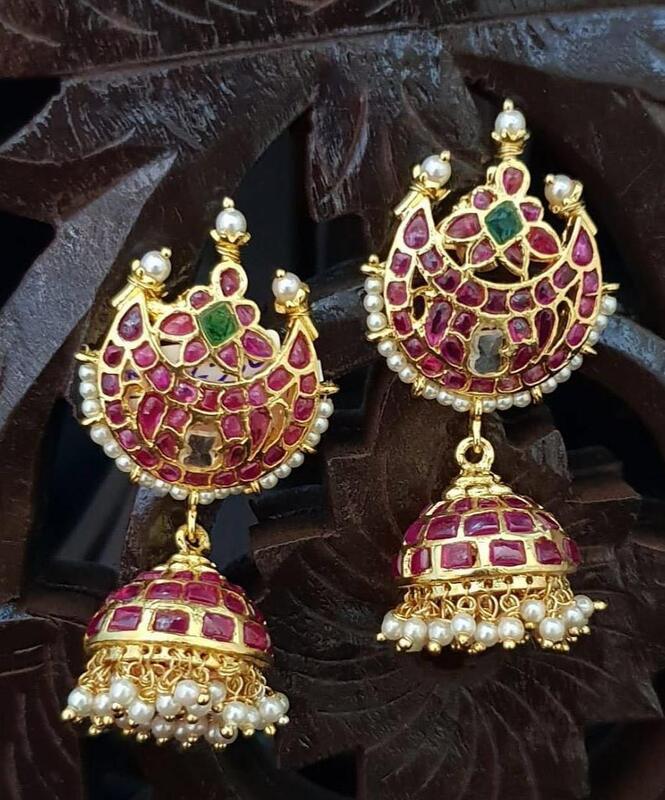 The exquisite stone studded jhumka with connecting ear chains are classic. 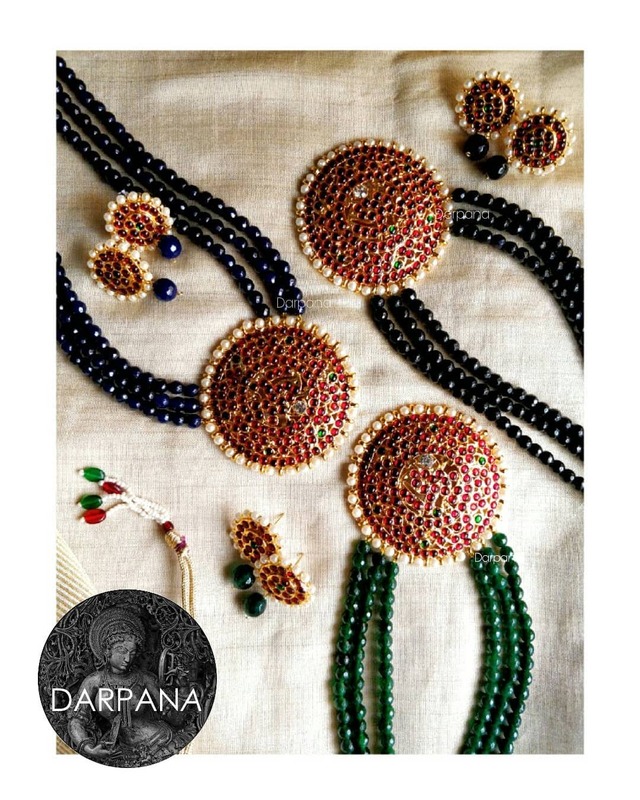 The brand Darpana has some exclusive collection of temple jewellery and contemporary jewellery as well. 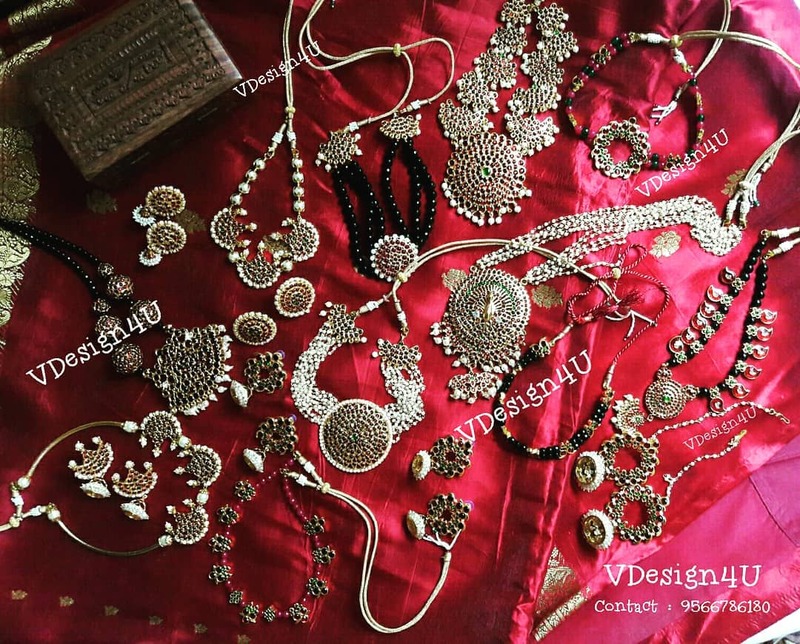 If you are looking for temple jewellery with a mix of contemporary designs then Vdesig4U is the right place for you. 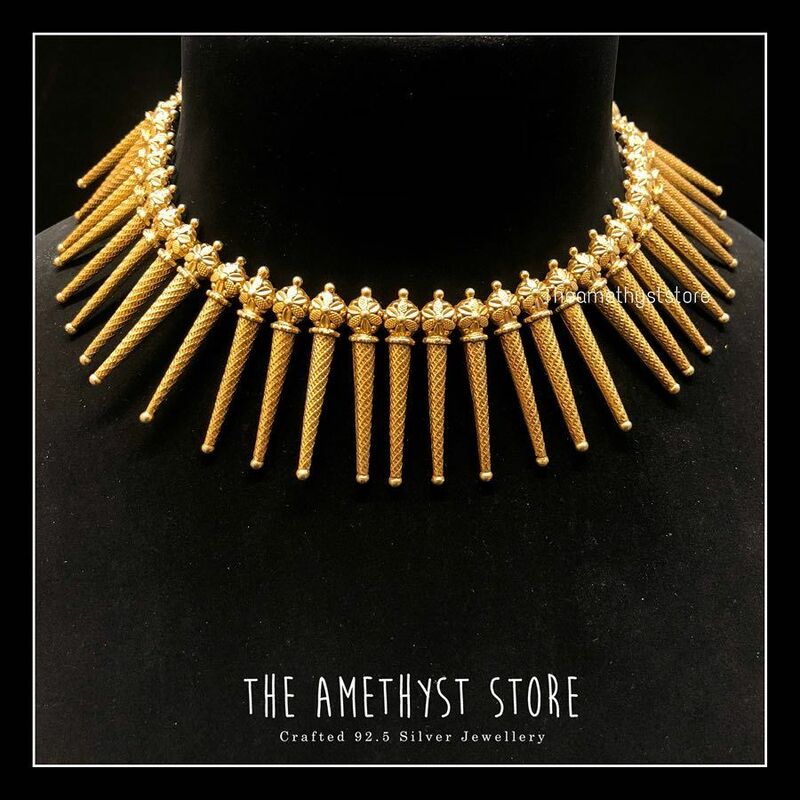 The online store has a wide range of collection which includes thread neckpieces in various colours, temple jewellery and contemporary jewellery. 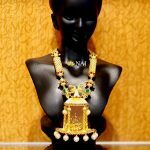 The handmade necklaces and traditional necklaces such as a kanti necklace cannot be missed from this brand. 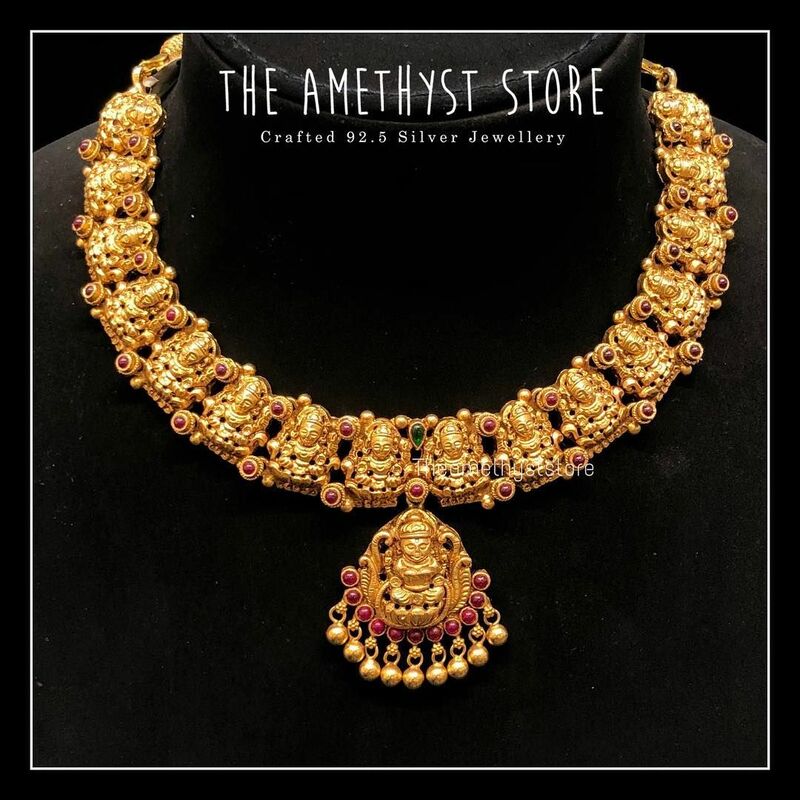 Azhagi is one brand that has a mix of traditional temple jewellery as well as assorted array of other trending jewellery designs. 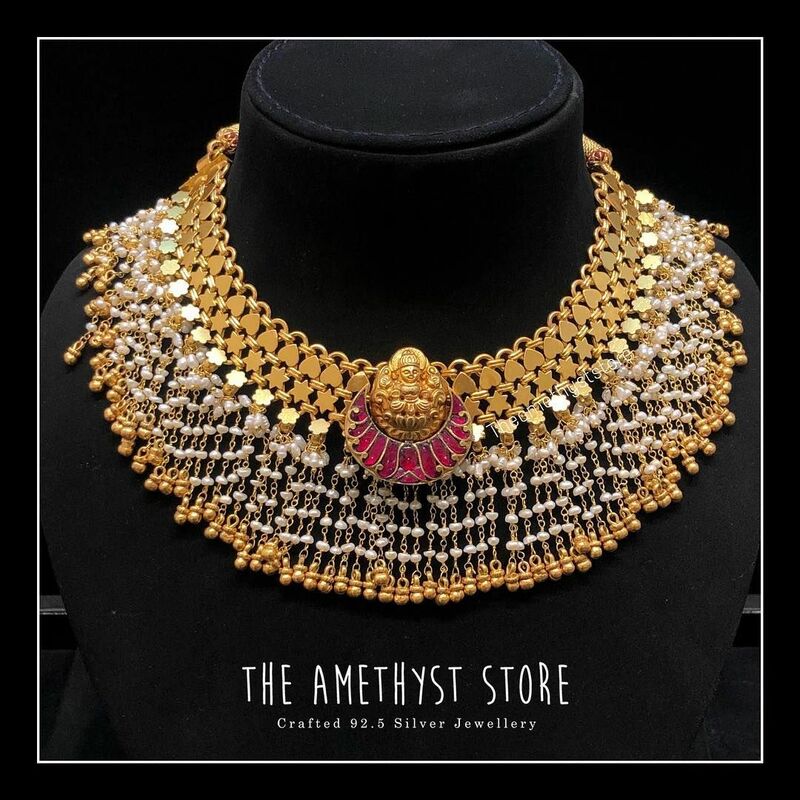 Their exclusive jewellery collection includes traditional neckpieces designed with semi precious stones and the contemporary jewellery designed for the trendy women. 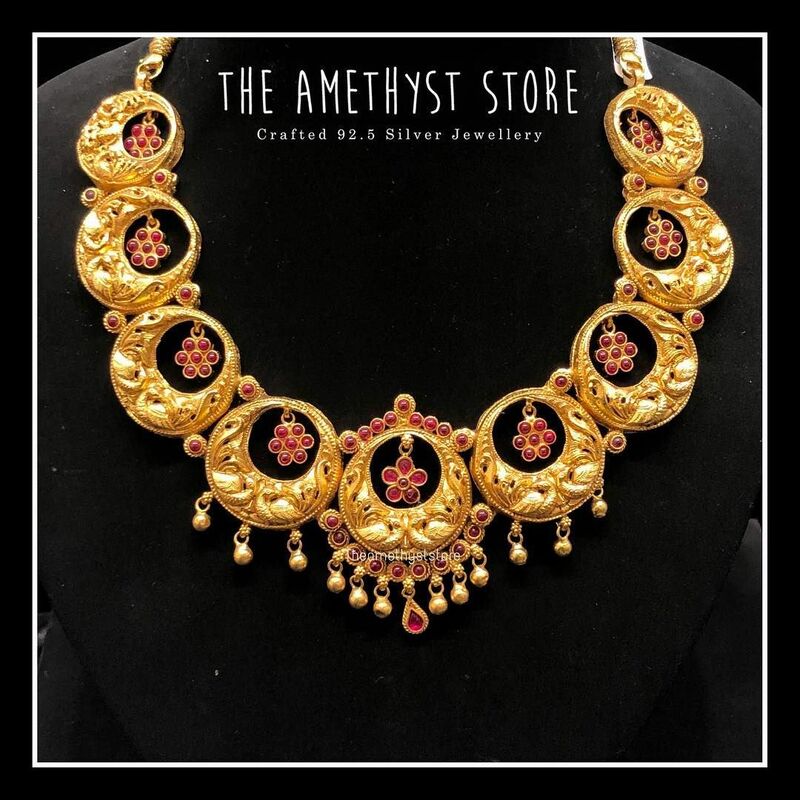 The neckpieces and other pieces of jewellery are handcrafted beautifully which can be worn by Bharata natyam dancers for the performances and also by every other woman who loves to wear beautiful jewellery. Blue is the colour of the season and there is a huge collection of blue necklaces available in the online store jayashandi works. 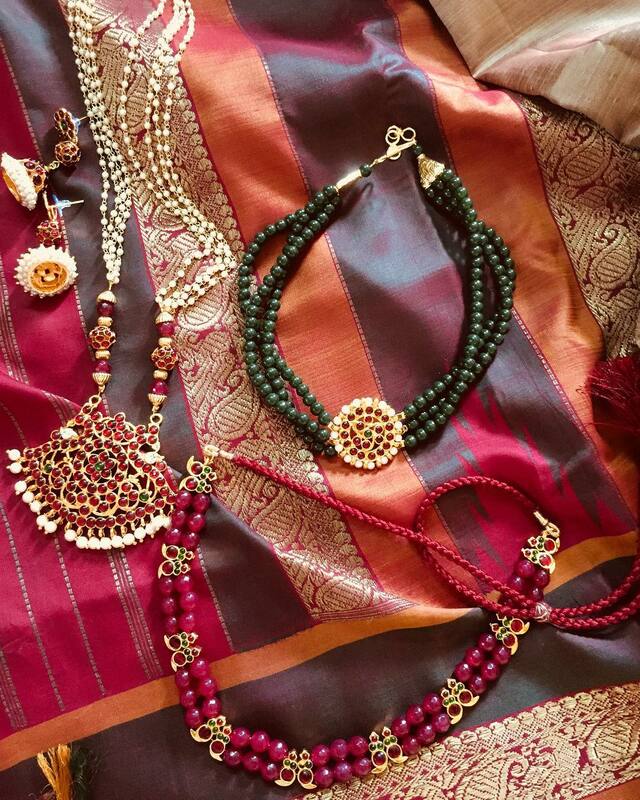 Silk thread jewellery is the latest trend and the variety of silk thread necklaces with ethnic look and contemporary look can match both the ethnic and modern outfits. Women love to wear jewellery that matches with the outfit according to the occasion and other factors. 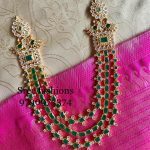 Jayshindi works has the jewellery that can is apt for every occasion and look right from trendy silk thread necklaces to traditional addigais. 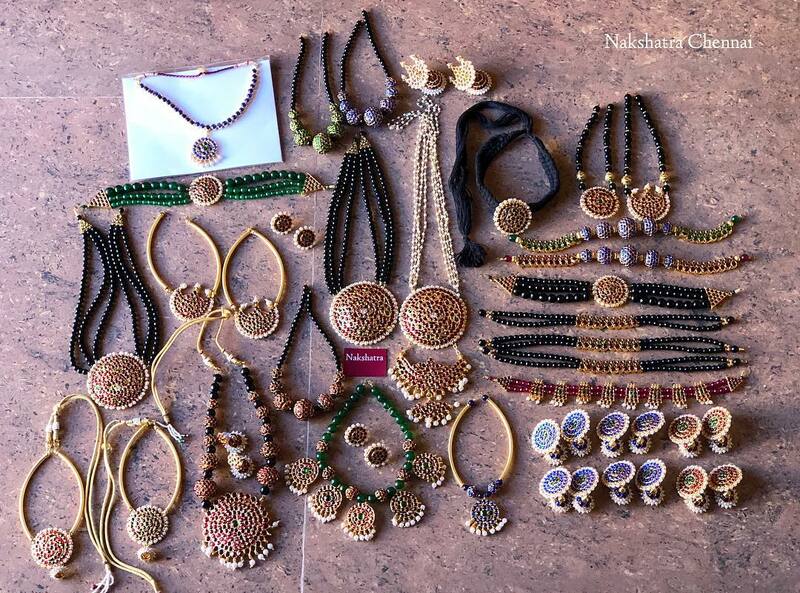 The adorable semi precious temple jewellery from Nakshatra Chennai includes a wide range of jewellery such as huge party wear earrings, choker necklaces, beads necklaces etc. 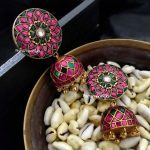 If you are looking for something unique such as enamel jewellery, party wear jewellery, hand painted jewellery etc. which no woman can resist buying then Nakshatra Chennai is the right place for you. This brand has a wide range of Bharata natyam temple jewellery collection as the name suggests. The collection include hair accessoires such as plastic half ring with stones, the rakodi sun and moon pendants, nethichutti which are a part of Bharatanatyam attire. 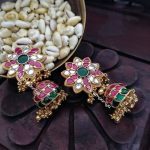 The Bharata natyam temple jewellery from this brand includes the traditional jewellery pieces that can be worn by the dancers while giving performances and all the beautiful ladies who like to dress up traditionally for important occasion. 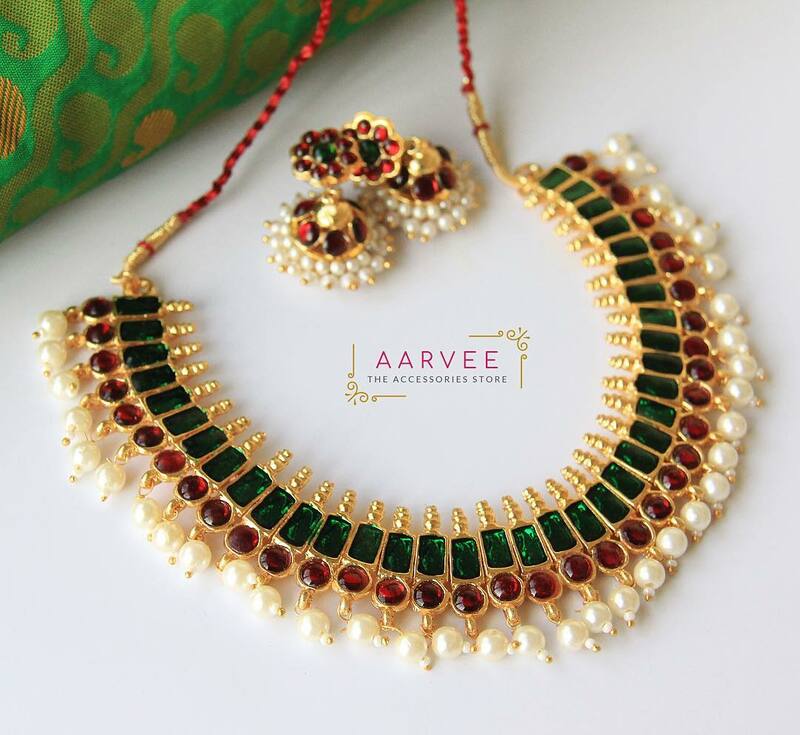 Aarvee is a brand that has an exciting range of jewellery both in traditional and contemporary designs. 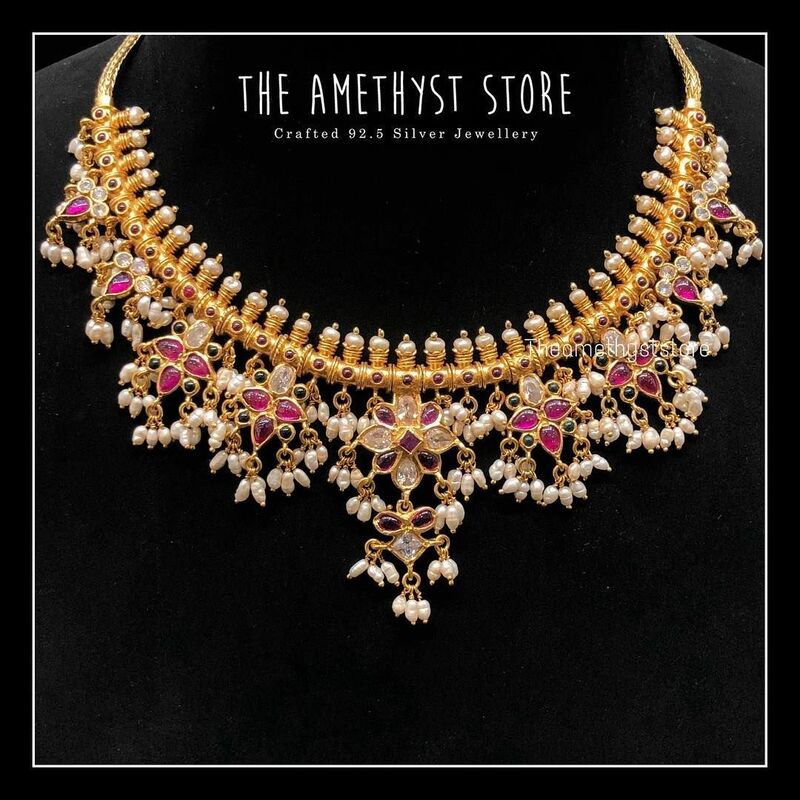 The jewellery collection includes the traditional kerala necklaces and chettinadu neck pieces which go well with the silk sarees. The contemporary jewellery includes hand painted jewellery, beads jewellery etc. which go well with both ethnic and modern outfits. Terra Studio has a huge collection of semiprecious jewellery made of exotic mix of kemp stones. 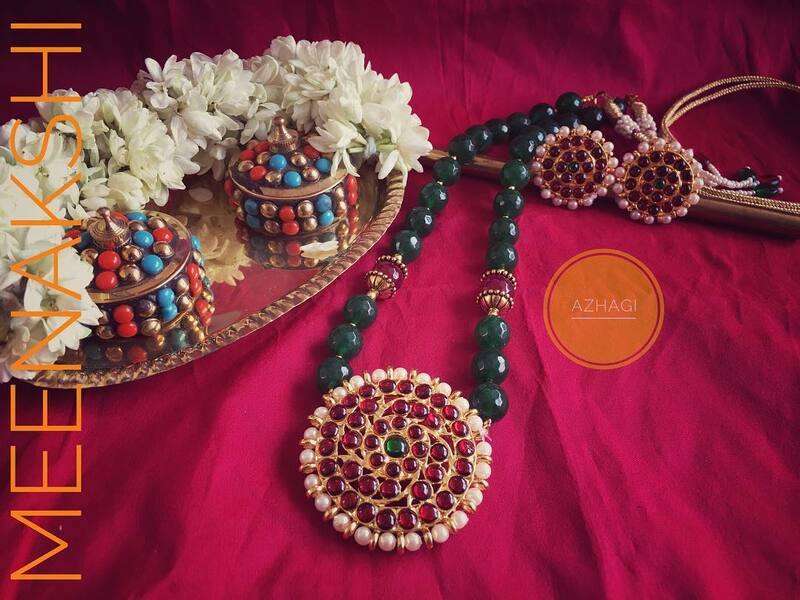 Terracotta jewellery is trending these days and the handmade, beautifully painted terracotta jewellery from this brand adds up to your elegance and beauty quotient. The beads jewellery and the silk thread jewellery from this brand is class apart. The trendy and ethnic jewellery collection from this brand can be worn for occasions, events and performances to stand out in the crowd. 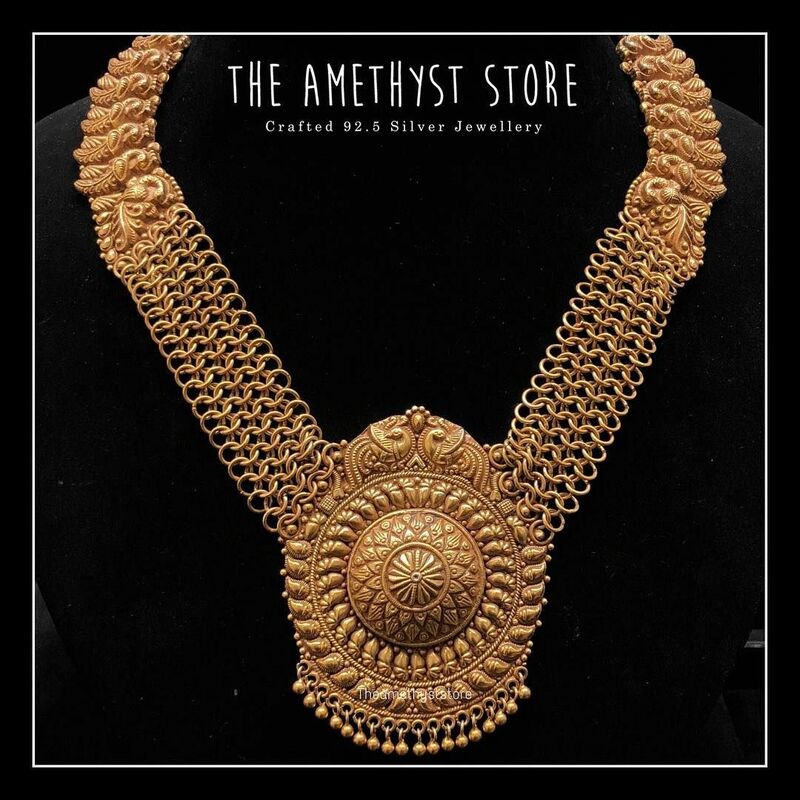 Another brand that has an exclusive range of Bharatanatyam temple jewellery is Dreamjwell. The collection includes unique temple jewellery which includes huge jhumka studded with stones, beautiful neckpieces and stone studded bangles to name a few. 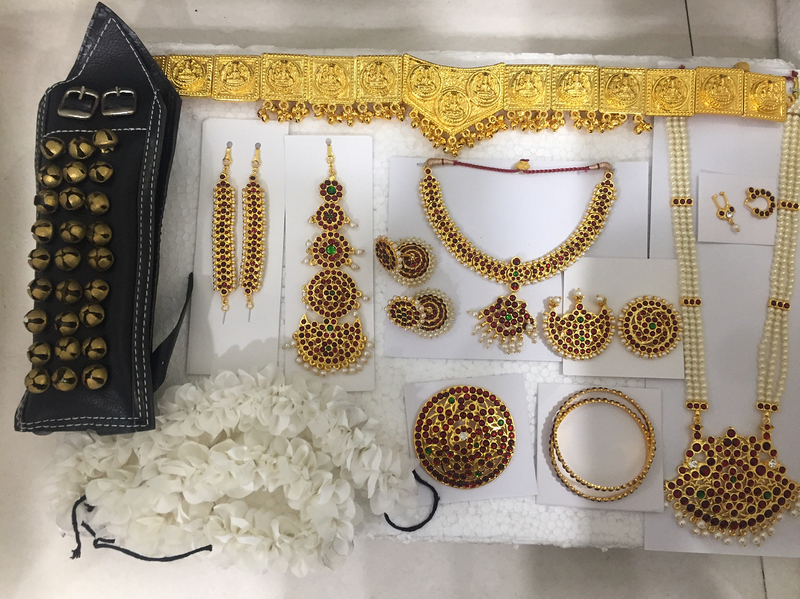 Besides these the brand also has variety of gold plated jewellery designs as well, which will be loved by young women and girls. 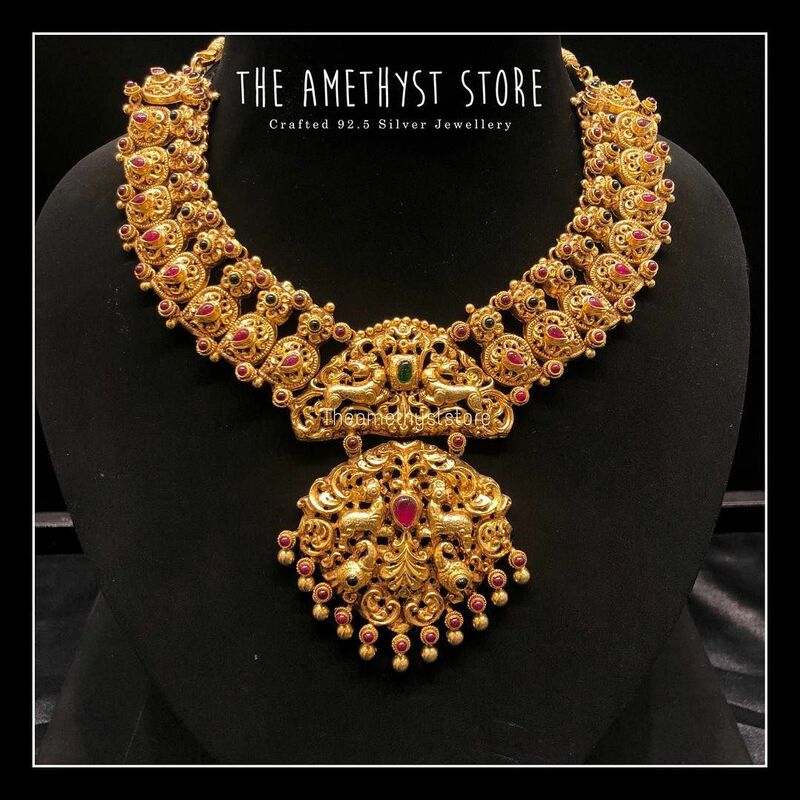 These are some of the Bharatanatyam temple jewellery collections and the latest jewellery collections from top online brands. We are in love with this jewellery collection and hope you have enjoyed the collection as much as we have. To shop the collections featured on this post, please reach the respective seller. 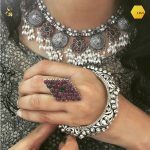 How i can buy this jewellery?